Buchan’s health was simply not good enough to allow him to enlist at the start of the Great War, or subsequently (the problem seems to have been ulcers). I was thirty-nine and consequently well over the age for enlistment, and in any case no recruiting office would accept me. So I went to bed for the better part of three miserable months, while every day brought news of the deaths of my friends (Pilgrim’s Way, 163). He was determined to play his part, however, and he very soon—while still in bed—began to write for the Edinburgh publisher with whom he had already worked. Nelson’s History of the War was published regularly from February 1915 to July 1919 in instalments of 50,000 words, and had huge sales: all the profits, including Buchan’s royalties went to the families of those of Nelson’s former employees who had enlisted, and to other war charities. Buchan also acted as correspondent for the Times and the Daily News, and wrote other books on the war. In May 1915 The Times asked Buchan to visit the front, at the time of the Second Battle of Ypres. His first report was published on 17 May. The first sight of the front was an anticlimax. The whole hinterland is a beehive of military preparations and leaves an unforgettable impression of sustained effort. Then come the last narrow roads filled with battalions retiring into reserve or advancing to the trenches, and motor convoys without intermission, and every hamlet full of khaki. And, at the end of it all, those red zig-zags and smoke puffs and muffled undertones of sound. A spectacular battle with flags and charging masses would seem a fitter climax. But, as one looks there seems a greater drama in this secret warfare, hidden in the earth and the crooks of hill. There is something desperate in its secrecy, something deadly in its silence (quoted Adam Smith, 194). He had talks with Haig, French, Allenby and others, and was able to look up old friends at different points along the Front. In October he visited France again, but this time on behalf of the War Office, and this time he was in uniform: he was a second lieutenant in the intelligence corps. By the middle of 1916, when he visited France again, he was a Major in the Intelligence Corps. He was put on Haig’s staff: “He is very gentle and wise” he said of Haig (Adam Smith, 198). He was consequently in France for the second part of 1916, and into early 1917. Compared with most men I had but a small share in the dangers of campaigning, but I had a full measure of its discomforts, since for the four years of the war, and for some time afterwards, I was almost continuously unwell. The battle of the Somme was one long nightmare, when ill weather and fatigue had to be endured by a body which was nearly always in pain and was steadily declining in strength. My time in France was purgatorial, for, though I had few of the hardships of the actual trenches, lengthy journeys in the drizzling autumn and winter of 1916, damp billets, and irregular meals reduced me to such a state of physical wretchedness that even today a kind of nausea seizes me when some smell recalls the festering odour of the front line, made up of incinerators, latrines and mud (Pilgrim’s Way 163-164). 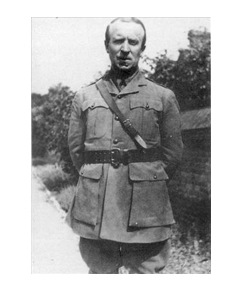 He delivered a report on propaganda policy for Lloyd George’s new government in January 1917, and his old South Africa boss Milner urged Lloyd George to make him director of a new Department of Information. He was appointed on 9 February 1917, and given the title lieutenant-colonel; he was to report directly to the Prime Minister. Buchan divided the department into four sections: art and literature (under Masterman at Wellington House); press and cinema; intelligence; and administration (located in the Foreign Office). Buchan continued the tradition established by Masterman at Wellington House, who continued to work with Buchan. One of Buchan’s great innovations was to use film for propaganda; he was also a great advocate of the idea that propaganda should be aimed at the British at home, as well as at allies and enemies. He was particularly conscious of the need to direct an effort to the USA, which was thought to be seriously underestimating the efforts of the British in the War. His letters give an impression of his efforts (quoted Adam Smith 204-205). 16 May 1917. I was working till all hours yesterday. I had to go to the Palace this morning, for I have a shocking amount to do with Royalties these days. Then I had the War Cabinet in the afternoon and a long time with the Prime Minister; and after that correspondents and secret-service agents. 23 May 1917. I had a busy day yesterday, a good deal of it spent at Buckingham Palace. I have had many queer jobs in my life, but this is the queerest. 13 June 1917. This job is certainly the toughest I ever took on and there is no kind of end to it and certainly no kind of credit in it. Still if I can do any good to the country it is worth every effort. It did not go entirely well, and he was attacked by the press and by ministers. In December 1917 a committee recommended a reorganisation, and Sir Edward Carson, a member of the war cabinet, was put in charge of the department, with Buchan remaining executive head. On 4 March 1918 the department became a ministry, with Lord Beaverbrook as the minister and Colonel Buchan as director of intelligence. I am very busy, but finding my work much more satisfying. Beaverbrook has an astonishingly candid mind and is so willing to learn. On the whole I am having a much easier time than last year, for I have far more assistance now (quoted Adam Smith 2011-212). The genuine conscientious objectors was, in many cases, denied even his legal rights, and a number of sincere and honourable, if abnormal, beings were subjected to a persecution which could be justified on no conceivable grounds of law, ethics, or public policy (quoted by Adam Smith 215). By the end of the War Buchan was in almost the same state as he was at the beginning. My information comes from H.C.G. Matthew’s entry in the Oxford Dictionary of National Biography, supplemented by the standard biography, Janet Adam Smith’s John Buchan: A Biography (1965; used in the Oxford University Press paperback, 1985) and by John Buchan, Pilgrim’s Way: An Essay in Recollection (Boston: Houghton Mifflin, 1940).